The Stone Foundation symposium for the year 2006 will be held in Hood River, Oregon. The local host for the event is David Rael of Rhino Tools. David is so pumped up about the vent he started a blog to keep everyome imformed of what is going to happen in Hood River, from Sept. 28th through Oct. 1st. 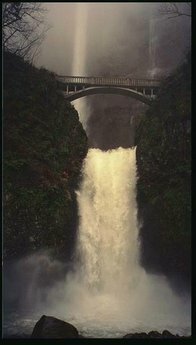 He posted this picture of Multnomah Falls, awesome shots here and for those of you that know me . . . well; you know this got me pumped. I am ready to make something happen-right now. TSF is a collection of all types of people with one huge thing in common-STONE. We love stone. What started out as a get-together for Stone masons, particularly those who do dry work, has snow balled into something completely beyond that. Stone junkies have found out and have just worked their way into the organization. Me, included. Nowhere else can I find these kind of people, and make no mistake about it they are great people. Attend one event and you will understand. You are pulled in for the love of the stone, but become something else when you get to hang with a bunch of folks who love taking rock and turning it into stone. Previous PostPrevious Sewer Tiles . . .